There is so much truth behind the quote "It takes money to make money," but when you're first starting out, it can be easy to let what you should invest in and what you can actually afford, distract you from putting in the necessary work. I've seen business owners with incredible ideas hesitate to bring them into the world because they didn't have a beautiful, fancy website. I've also seen business owners take way too much pride in running a one woman show when in reality the lack of extra support is actually limiting their chances to scale. I'm all for taking calculated risks and making sacrifices in order to invest into your business but I am also a huge fan of running a business that is as lean as possible, especially in the very early stages. So where should your time and money be going? Here are some areas to invest in depending on where you are in your business. While everyone's financial situation is different, these particular areas are where I have invested and currently plan to invest as I work to grow LOE. I'm all for taking calculated risks and making sacrifices in order to invest into your business but I am also a huge fan of running a business that is as lean as possible, especially in the very early stages. Not every tool or resource will work for your business or your ultimate goal. It's ok to not do what everyone else is doing. Focus on the tools that will help you to grow your business in the long run and that will help you to gain clarity early on. Look at your time as an investment just like money. Many tools require you to work and learn in order to see results. Sometimes it takes more than just swiping your debit card. Don't be afraid to drop an investment if it is not working for you. Not every risk will produce great results. Again, I am big on keeping your business as lean as possible in the beginning. But if you want your business to be taken seriously and if you have big dreams of growing your brand in the future, then it will take some investing. Here's is where I would put my focus just starting out. A basic website. Notice that I didn't say a fancy, super expensive website. I highly recommend not pouring your money into a new website in the early stages of your business because you are most likely still in the learning and growing stage. Your message typically isn't 100% clear and you're probably still trying to figure out who your ideal audience is. All of these things are going to be important to you when you are getting a website designed, so why pour money into something that has a 50/50 percent chance of changing. I suggest investing in a basic Wordpress theme or going the Squarespace route. Anything that you can create on your own that will get you going until you are ready to make a big design investment. At the point of writing this, LOE is coming up on its one year anniversary and we're just now getting to the point of needing to hire a designer. Your email list. This investment doesn't necessarily have to include money just because many platforms like MailChimp and MailerLite offer free plans up to a certain amount of subscribers. But it can be a learning curve which means investing your time in learning how to start and grow your list. An accounting software or system. When I started my first business my money was everywhere. I was getting business and personal expenses mixed up and it caused hell at the end of the year as I scrambled to prepare for tax season. Even if you're only making $100 in your business right now I highly suggest investing into some type of accounting system or software so that you can get in the habit of managing your money. If you struggle to manage $100 how will you be able to handle $100,000? I suggest our Keep Track System as an affordable option to get you started! A social media scheduler. We live in a world where everyone is attached to their phones. So even if you're resistant to be on social media, it is a vital part of sharing your content and products with the world. But as a newbie business owner, you may be a little strapped for time and can't commit to posting on social media everyday. If this is the case, you should invest in a system that will allow you to consistently share your content without you being online all day. I recommend SmarterQueue because of how the system recycles your tweets and Facebook posts, TailWind for Pinterest and Planoly for scheduling Instagram posts. Again, look at what areas you need the most help in and invest accordingly. Some type of branding resource. One of the biggest mistakes I made with launching a new business was trying to figure out what "branding" actually meant and also how to do it myself. To make sure your messaging is clear and that you are targeting the right audience I highly suggesting in investing in some type of branding course or maybe even a coach early on. You can find a ton of classes on sites like SkillShare but I personally recommend the Better Branding Course from Made Vibrant. Not sure when you should start investing back into your business? Check out this list of investments depending on where you are in your business. Now that you've gotten started and you're beginning to see positive results, it means that you are ready to take the next steps so that you can continue to bring in new income. At this point, I would consider investing in a coach or a mentor. More specifically a coach that can help you in an area where you will feel you are not the strongest. For Living Over Existing, I struggled with the marketing piece of growing the brand so I have invested in a coach that specializes in marketing and profitability. 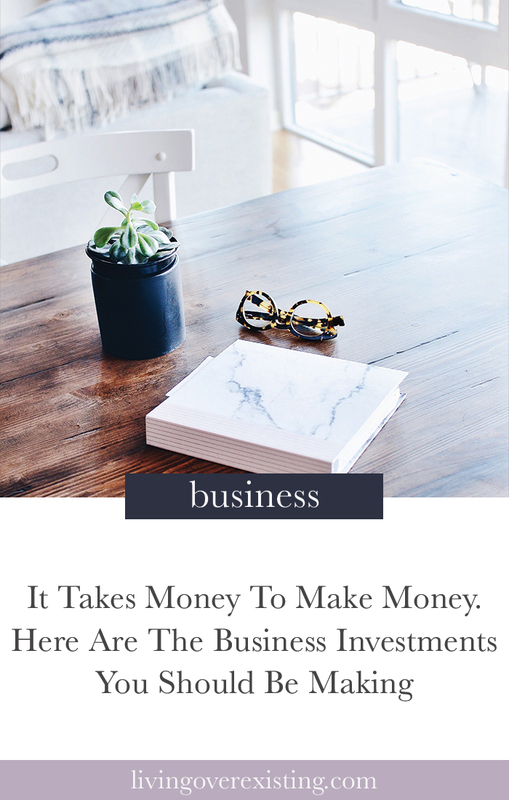 I decided to wait until I was bringing in money to make the investment because I needed to give my coach somewhere to start and I needed to also know that I would be building on a legit business model and not just something that I hoped would work. Someone who has a proven experience. Check out their background and what other clients are saying about their experience with them. Ask for referrals from other business friends if possible. Work with people you trust. Do you truly feel like this person would have your best interest in mind? Have you seen results from trying out their free or lowered priced content and resources? or do you feel as if their only interested in getting their next check? Hiring a coach will probably be one of the biggest business investments you'll make so it's important to work with someone who has your best interest at heart. You've now proven that you can not only build a solid brand but you can make money and make money consistently. At this point it is time for you to level up your systems so that you can put more focus into growth and less on tasks that don't specifically require your constant attention. Here's what to consider investing in next. Hiring out help. Whether you decide to bring on a freelancer or a legit employee, you have to understand that running all of the pieces of your business alone is going to limit how big your brand can grow and how fast. To figure out where you need to hire, write down everything that you do in your business that doesn't necessarily require you. For example, if you are a business coach then you are the only one that can complete that task. But scheduling social media and sending out follow up emails can be something that you delegate to a virtual assistant. After you consider what can be delegated, take a look at your budget and decide how much you can actually afford to pay someone. QUICK TIP: Don't feel compelled to hire a ton of people at one time. Slowly take tasks off of your plate by only hiring as you need. Join a mastermind for continued support. Running a business is hard and even harder when you are alone. Once you're in a good position to begin scaling your business, I suggest joining a mastermind program of sorts. Not only will you have access to other business owners who are on the same level as you but you will also gain the knowledge needed to continue to grow your business. Again, everyone's situation is different and some may see a need sooner than others. The point is, making investments in your business is necessary but you also want to make sure you are making smart investments as well. Decide to what is a priority and create a plan for how you're going to make that investment happen. **this article does contain some affiliate links.